Is it necessary that a King and a Crown Prince live in Greece to restore the monarchy ?, NO, King George lived in London and King Pavlos lived with his family in Alexandria when they were restored. For a monarchy to be restored it is necessary that values ​​exist in society, it is obvious that now in Greece have increased sympathies for the royal family, but that does not translate into restoration, it is necessary the existence of values. The values ​​of a society, can to change, and that is obvious today you are talking about Donald Trump as President of the United States, true. Here the most uncertain is the future. Hope will always be there. He has not given up hope. It is irrelevant whether he lives in US or lives in London or Greece, his hope is present in him. About his family. It is true that his wife does not seem to want to know anything of the matter, does not know Greek, does not know the Greek customs and seems not to change. Prince Pavlos has done everything to persuade his wife to learn Greek culture,.... and his children, he hired a private Greek teacher to learn Greek when their children were more young, however, it is Obviously did not had the collaboration of his wife, and it seems that his attempt has been frustrated. However, it is obvious that he has taken measures, he is the prince, is not his wife nor his daughter, he is the only one who has accounts of social networks with the nobility title, and it seems that it is norm in the family , I observe certain attempts of Maria Olympia to create account in social networks with the title of Princess, but the Prince says that no. If you want to be a Princess, you should learn Greek, and culture. I doubt Pavlos has ever truly expected the monarchy in Greece to be restored; he and MC both seem like realistic people. I consider the situation of Pavlos to be similar to that of the non-heir children in other royal families. They can still be connected to their country of birth but they're aware that as time goes on their role will become smaller and they're expected for the most part to follow their own path in life. Plenty of them live outside "their" country and it's not a big deal. From the limited amount that can be gleaned from photos, interviews, social media, etc, Pavlos seems like a caring husband and father. He's close to his siblings and cousins. He has an interesting group of friends. I doubt he wastes much time wishing he was a reigning monarch - he's seen what a constricting life that can be first hand with his relatives. I feel sympathy for Constantine, who lost something he already had. But Pavlos most likely doesn't feel that acute sense of loss. I think it's best that he's built a life for himself that doesn't revolve around Greece and a possible restoration of the Greek monarchy... even if that life isn't to everyone's taste. All of the comments above are causing me to believe I judged Pavlos and his wife perhaps a little too harshly. I feel sad for Pavlos if what several people here have posted are true. I like Prince Pavlos and he has already shown in several interviews that he is interested in the affairs of Greece and that he cares. Marie Chantal does not care and is more concerned about her business and other things. The children of Pavlos and Marie Chantal have a different life but are probably familiar with the family history and the responsibilities they would have if Greece were still a monarchy. We must not forget that Kings Constantine and Anne-Marie returned to Greece and Prince Nikolaos and his wife also live in Greece. Prince Nikolaos is also involved in the political life of Greece, I think he would be a good king. Strange. I pointed out over and over again that it is NOT expected of Pavlos to gain a restoration, BUT to take up responsibility as the eldest son of a former monarch of one of europe´s oldest and proudest dynasties. Pavlos´family, he himself and we all know that a chance for a restoration are very close to zero. But, again, that is not the point! Calling myself "exiled CP and CPcess of Greece" means something - even more so when you have declared over the years repeatedly that you think about living in Greece (before it was possible to return, P. STATED, he wanted to live in Greece! ), that you care, that you wanted to do every thing in your limited power to stand by this nation, etc. In fact little, if not nothing, happened. I´d even go so far to claim he and MC have and OBLIGATION to live there - more than Nikolaos and Tatiana! What happened to King Paul´s (private) motto "It is not so bad when the King suffers, the main thing is the people do not suffer", also many times repeated by King Constantine in several interviews? Plenty of exiled royals live abroad? Well, CP Alexander and wife (Serbia) live in their family´s old palace in Belgrade, CPss Margarita (Rumania) lives in her family´s former palaces in Bucarest, portugese royal family lives in Portugal, King Simeon and Margharita live in Bulgaria, he even served the country as PM, german´s ex-imperial family live in Germany, the young hereditary Prince of Hanover has moved from London (although he has been born there) to Hanover and works very hard on his familys heritage and is very much involved in Hanover´s public and social life. Many other former german royal or princely families never gave up their heritage and are managers of their estates and castles (Thurn and Taxis, Saxe-Coburg-Gotha, Bavaria to name only a few). Minor members might well live abroad. But the heads and their immediate heirs are well and truly in charge! The prince heir's family is skiing in Switzerland.MC has posted photos in her Instagram. According to his son Konstantinos Prince Pavlos "still got it"
Mother and daughter enjoy the sun!! "Χριστός Ανέστη Happy Easter from the desert ��"
"On Wednesday, April 26, the "The Prince's Trust International" was launched in Greece. It is the philanthropic organization founded in 1976 by Prince Charles, the heir of the British throne. Head of the Foundation in our country, Prince Pavlos, taking over the chair of the Advisory Committee. Prince Pavlos has a strong desire for the security, stability and prosperity of Greece in these crucial times we are in. The inherent sense of his duty as a Greek and his thoughts for the good of our country grew in their own time and is now active. "A while ago, Prince Charles asked me to take the chair of the Advisory Committee of The Prince's Trust International. I was glad to meet, and for my part I asked him to start from my country, "explains journalist Christos Zambounis, about ESTIA. The next moves of Prince Pavlos will be to work with Greek charities to expel specific youth employment and education programs in our country. "All" will be discreet, with no bubbling, because they are inconsistent with the mentality of the Institution." 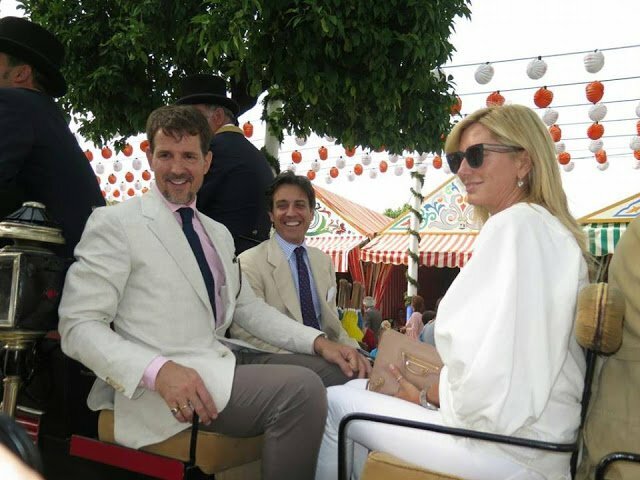 Prince Pavlos and Princess Marie Chantal are in Spain, Sevilla at "Feria de abril", ,they have been invited by José Antonio Ruiz-Berdejo , he is boyfriend of Pia, sister of Marie Chantal. I think it's great news that Prince Pavlos participates in a project like this. This will be good for Greece and he will travels more to his country. In Sevilla, They were at a luncheon invited by the Duke of Alba, in the Dueñas Palace. At night , they were, at a party in "Pilate House", it is a palace of the House of the Alba, in this party , were the Prince Filiberto of Savoy And Flavia of Hohenlohe and Medina. Prince Pavlos has published in his account of Instagram more Photos of Sevilla. The Princess was mentioned in the Sunday Times Rich List 2017 - for some reason they now group Robert Miller's wealth as being that of "Robert Miller and Princess Marie-Chantal and family" ranking him/them as 81st with a wealth of £1.58billion. Seems like the Crown Prince and Princess were enjoying the April Fair in Seville! wow - do these 2 ever stop? norway, spain, italy all in the space of a few days, not counting netherlands where they visited some weeks ago for WA's birthday.